May 2017 be your most stylish year ever! 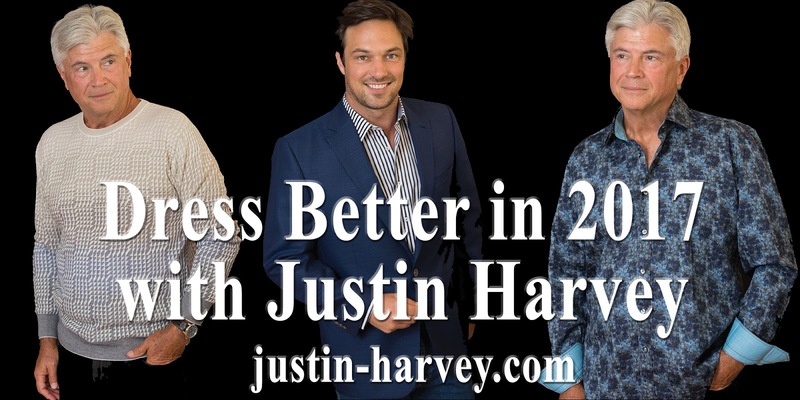 Happy New Year from Justin Harvey! There are all sorts of predictions for the men's fashion trends that will be big in 2017 and the same was true in previous years. Does anyone remember the predictions from just a few years ago, did they come true, does anyone care? We have spent some time reading predictions and most appear to be things that the folks at Justin Harvey have been doing for a long while. For example, businessinsider.com has a article about their men's style predictions for 2017 and one of their predictions is "Pants will become stretchy, Including a touch of elastane in pants, even jeans, will become the norm in 2017. Once men get used to it, they'll realize the pants are more comfortable"
Justin Harvey has been providing pants with a bit of stretch for years, our Marcello Sport Jeans and Ecer Traveler Pant have a bit of stretch to them and fit incredibly. There are all sorts of trends and "street styles" that are all well and good, but for actual men who do not live in NYC or LA we suggest staying away from the trendy and focus on "upgraded traditional". Take a traditional look and upgrade it with a little something extra, accent fabric, fine detailing, custom buttons, something that indicates superior workmanship. Check out the shirts on justin-harvey.com from Marcello Sport, Brandolini, Visconti and many more to see items with something extra. For 2017 the biggest trend we see in men's fashion for real men is quality. Men are getting tired of shirts and jeans that fade too quick and wear out too fast. Quality is having a comeback. For the 20ish/teens the "street style" and being a walking advertisement for a brand will still be popular, but for men, quality traditional looking fine clothing are going to be the style of choice.